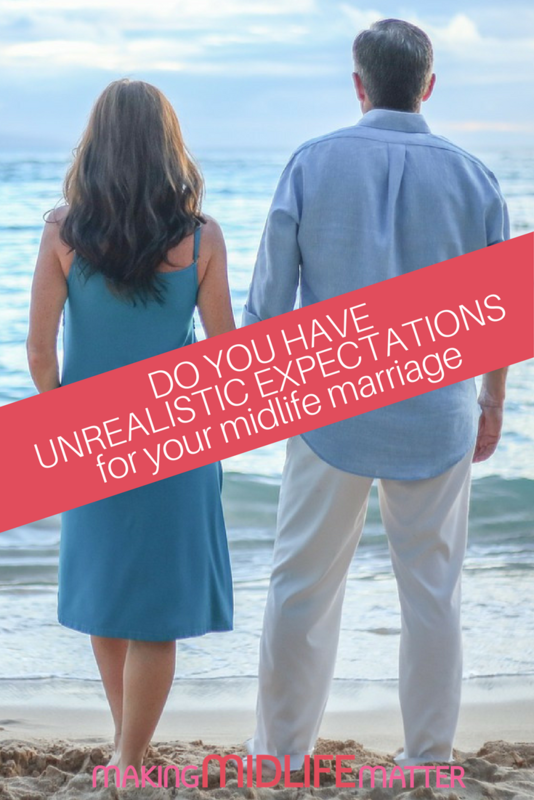 Do You Have Unrealistic Expectations For Your Midlife Marriage? This piece first appeared on Cresting The Hill. See the author’s bio and contact info below the post. I was talking to a friend about midlife marriage the other day. She lives in a perpetual state of “hope deferred” (as she refers to it) and “constant disappointment” (as I refer to it!) She keeps waiting for her husband of 28 years to step up and be her knight in shining armour. She is certain that her marriage should be a fairytale and is so disappointed that it’s not. I don’t even know where to begin with this. I felt like the big meanie pants when I told her that midlife marriage isn’t about castles in the sky, and doting love, and dropped handkerchiefs. It’s certainly not about making up tests to see if your husband loves you as much as you think he should. It’s not about feeling constantly sad because you don’t have the ideal romance happening every day. Why would you set yourself (and your partner) up for failure by having such unreal expectations? Midlife marriage isn’t a fairy tale (although my husband mentioned there were ogres and wicked witches in fairy tales so maybe there was an element of truth in there!) Midlife marriage isn’t even fantabulous and fantastic every moment of the day. There are a lot of times when it’s not even all that great, and there are even times when it’s pretty woeful. But does that mean midlife marriage isn’t worth keeping and we should all be weeping into our hankies (that nobody picked up for us)? Should we be trading in our long term spouses for a newer model and hoping that will kick the excitement up a level or two and bring long lost romance and rainbows back into our life? Perhaps we need to buy one of the latest marriage manuals, or go to a romantic movie or two – just to show us where we’re falling down in the love stakes. I’m afraid I’m a pragmatist. I married my man for better and for worse. Sometimes I’d like to throw in the towel when the worse becomes the norm. I’d like to run away to a lovely little villa in the South of France and buy baguettes and drink coffee in small cafes. Dreams of peace and serenity dance in my head as I look at the latest crisis I’m dealing with. Because, in today’s world, the solution to any trauma is to cut and run – and don’t look back. But that same pragmatist in me knows, without a doubt, that the bad times will move on eventually and the good times will roll again. But you have to be prepared to put in the effort. You can’t expect the poor guy to do all the work, buy all the flowers, do all the apologizing. As nice as it would be to sit back and be wooed, midlife marriage is about continuing to invest in the relationship you started 30 or so years ago. Often we look back at our young selves and our early romance with rose coloured glasses. We forget things weren’t always rosy back then, there were still times of adjustment and compromise and learning to accept each other’s flaws. But we moved forward and the laughter and the love covered a multitude of sins. Our relationship deepened and we came to a fuller understanding of the person we married. But that doesn’t make it a fairy tale. Midlife marriage is real, and it’s nitty gritty, and it’s good and it’s bad, exciting and boring, interesting and mundane. It’s so much more than a fairy tale – the happily ever after isn’t a given any more, it’s something we have to work for and contribute to. We have to find our authentic selves and merge together without losing who we intrinsically are. We have to stay interesting and interested, we can’t afford to put our feet up and wait for Prince Charming. We married our prince all those years ago – and he may not be as perfect as we’d like, but neither are we. There is perfection in that imperfection – there is the knowledge that we’ve chosen each other again and again, when it would have been so easy to quit. 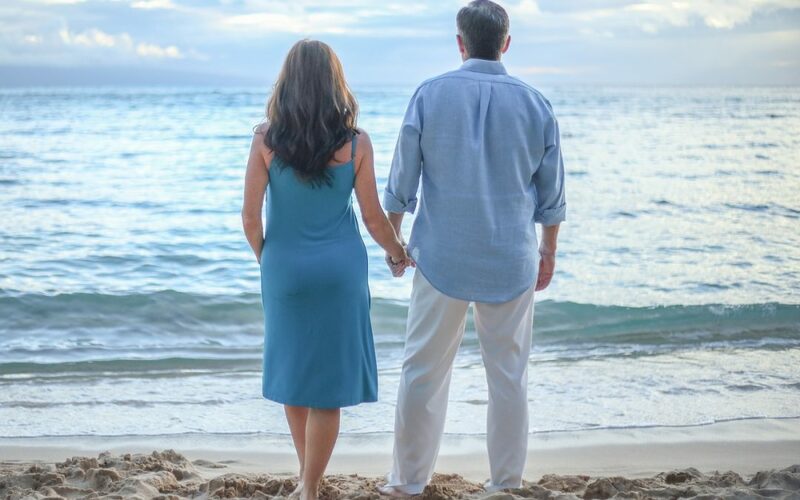 Midlife love and marriage is deep and wide and worth every second we invest in it. Hi I’m Leanne and when I reached the grand old age of 50 a few years ago, I had the choice of sinking into middle age or celebrating it. I chose to celebrate and from there I started Cresting the Hill. 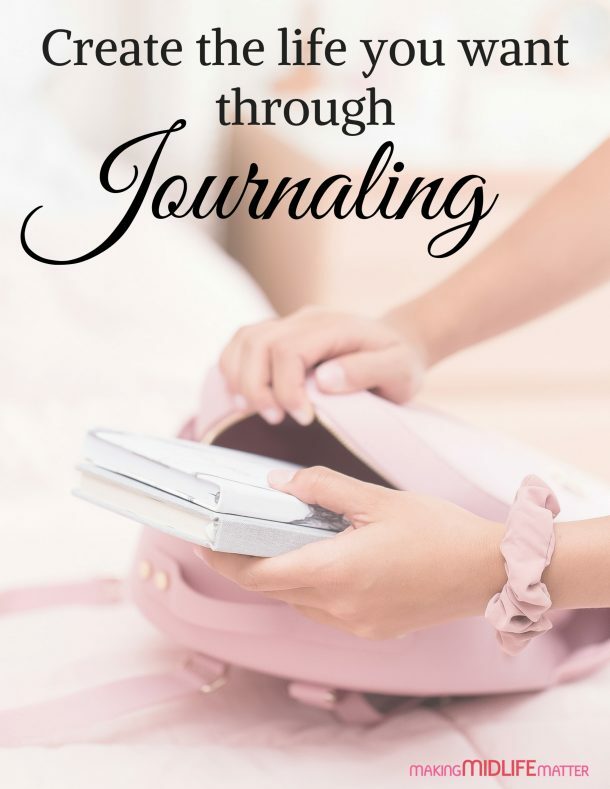 I found my voice again and I’m learning to define myself as a woman in my own right – not just a wife, or a mother, or by what I do as my profession. I’m discovering who I am, and I’m really liking that person! To quote Maya Angelou: “My mission in life is not merely to survive, but to thrive; and to do so with some passion, some compassion, some humour, and some style.” You can find me at, Cresting The Hill.